- "A small oyster poised for a big comeback," detailing UW research on advance restoration of the Olympia oyster. - "Researchers document salmon diversity using ancient DNA," which recounts WSU research showing loss of genetic diversity among northwestern salmon using exciting techniques. - "The faces of Washington Sea Grant workshops," an article that introduces some of WSG's most prolific workshop instructors and how their lives have impacted their teaching. 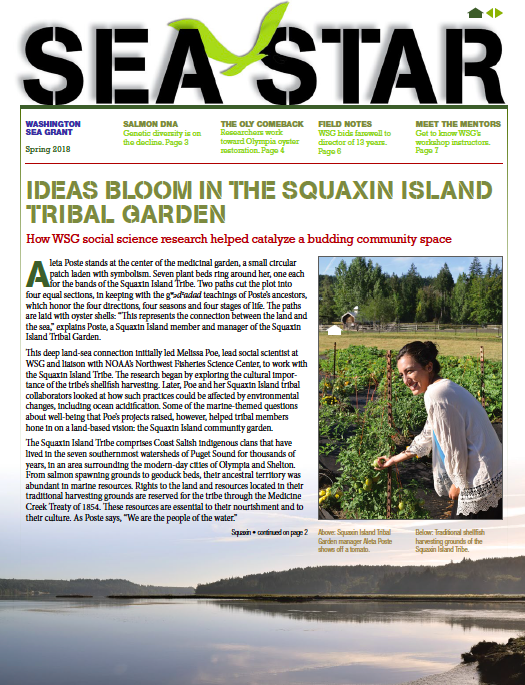 You can find this articles on the Washington Sea Grant webpage or by reading the web version of Sea Star. Many thanks to the great folks at WSG for this experience! Arrival at the Nuuk Airport. After a 7 hour flight to Reykjavik, an hour bus ride, another flight, a taxi, and a walk - we finally made it Greenland! We're getting ready to listen to talks and present at the Polar and Alpine Microbiology (PAM) conference, taking place at the Katuaq - also known as the Nuuk Cultural Center. Our arrival to Nuuk two days before the conference gives us the opportunity to explore the town and surrounding nature - something that's welcome, as I've never seen Greenland quite so green before. The last time our lab was here (2015) was during the month of March - the coldest point of the year for Nuuk - and every rooftop, mountain crag, and street corner was covered in pristine white snow. A less-than-perfect mash up of a picture I took in Nuuk yesterday (left, no snow) and in March of 2015 (right, with snow). Entirely reputable sources on Wikipedia say Nuuk was founded as the Danish port of Godt Haab in 1728 to relocate the earlier Hope Colony, which was founded by Hans Egede. You wouldn't know from looking around Nuuk that the town wasn't actually founded by Hans himself (submitted for evidence is a photo of a 12 foot statue of Hans), but rather a guy named Claus Paarss. Eponymous statues, buildings, and roads honoring Egede, a Lutheran missionary, are ubiquitous in Nuuk. Of course, this part of West Greenland has been inhabited throughout history by Dorest, Inuit, and Viking people in various succession. Hans Egede surveying the town he didn't found. Skip over three hundred years of history to 2017 and Nuuk is a surprisingly cosmopolitan city of about 17,000 people, mostly native Inuit but with many Danes as well. The city is growing fast - since 2000, it's increased its population by over 20% (info from Statbank Greenland). Compare that to Seattle - which has added about 140 000 people since the beginning of it's growth spurt in 2000, accounting for a 25% growth. One of the coolest things for someone interested in Arctic policy and science (me!) is that Nuuk has a strong place in circumpolar politics and field research. In fact, in 2011 the Arctic Council held its biennial summit here in Nuuk - resulting in this picture of Arctic Ministers and other state officials in front of the Katuaq. You'll notice our then Secretary of State Hillary Clinton right in the middle. Sending our Secretary of State to a Ministerial Meeting for the first time in 2011 was an important signal of the United States' growing interest in the Arctic - an interest we continued by sending John Kerry to Kiruna, Sweden (2013) and Iqaluit, Canada (2015, where Canada handed the rotating 2-year Chairmanship to the US), and most recently Rex Tillerson to Fairbanks, Alaska (in May of 2017, where the United States handed the Chairmanship over to Finland). The Ministerial Meeting in Nuuk also result in the Nuuk Declaration, presented to us on this flashy yellow paper. Join me at HiveBio's monthly discussion group! In the cleanest labs with the best technology, laser-cut channels thousandths of an inch thin are burned into glass and polymers to make devices for studying microliter volumes of fluid. These tiny instruments study phenomena in a microfluidic environment, free from influences of fluid dynamics on the larger scale. How can we use these microfluidic instruments to answer modern questions about life, on Earth and in the Universe? And what, as DIYbiologists, can we do to be part of this growing technique? This week, I'll show you how to craft some simple DIY microfluidic devices to exploit the world of low Reynolds number, and what questions we can ask as we use them. Join me at Ada’s Technical Books on Wednesday, September 21st at 7:30 PM to be part of the discussion! Discussions happen on the 3rd Wednesday of every month as part of the HiveBio Discussion Series. Any questions, comments, or suggestions of topics can be forwarded to me through the contact page. What kind of science are we doing at Palmer Station? Listen in to hear about some of the fun we're having testing our sample work flow by collecting sea ice and doing simple assays to measure the properties of the life inside it. (The quality of the audio is best with headphones). Palmer Station is tucked into a harbor on the southern end of Anvers Island. She’s a small station, just a few blue and gray buildings perched over the harbor of dark Antarctic waters. Watching over her, looming on an incomprehensible scale, millennia of encrusted snow form a glacier that covers most of the island. It only takes a little hike up the glacier to see one of the most spectacular panoramas of the hemisphere. The view is dramatic - in the middle foreground, mountains burn pink and orange from the low-hanging afternoon sun. July is austral winter here – that means we’re in the coldest and snowiest part of the year, as well as the darkest. When the sun does make it out, it heavily rolls right along the horizon for just a few hours a day. The colors of the mountains are offset by the deep blue and grays of the Southern Ocean which is full of waiting icebergs like tall ships in harbor. About center in the panorama are the few tiny buildings of palmer station, which are completely dwarfed by the icebergs sitting next to them, those tinted in an even more impressive marine blue. Then, to the right of the picture is the edge of the glacier we’re sitting on, which butts into the ocean and looks just like a postcard. I’m documenting my travels through Antarctica as part of an early career training course taking place in Palmer Station, Antarctica…in the middle of the Antarctic Winter. 15 Students, our instructor, and our TA, are holing up against the cold and darkness to learn how science is conducted in the most remote place on earth. I’m cataloging our journey through written and auditory journalism in collaboration with an ongoing podcast project I help run known as DIYbio.fm. This stories are being produced on sight in the field: in snow, on boats, in remote research stations, so it won’t be that studio quality sound you’re used to. But you’re going to hear the voices and sounds of the experience as they really are. Over the next few weeks, you’ll be hearing interviews, history, and hopefully some new knowledge as we capture the science, the sights, the stories of the people and the places – right where it all happens, at the bottom of the world. (As a disclaimer, none of this production is associated with the program’s organizing institution, nor my home institution. This is a project in DIY journalism, and in no way reflects the opinions or party lines of the US Antarctic Program. A second disclaimer- by the time this audio is being published, DIYbio.fm won’t be ready yet – so don’t go looking for it. I’ll be sure to let you know when it’s ready). So back to that question: how did we get here? The simple answer: by ship. So let me introduce you to the US Antarctic Fleet. Or, more specifically, the icebreakers of the National Science Foundation’s US Antarctic Program. The elder sister is the R/V Nathaniel B Palmer, built in 1992, and her companion ship is the R/V Gould. Those letters at the beginning of the ships names, they stand for “Research Vessel”. Sometimes you’ll see the letters “ARSV”, which stands for Antarctic Resupply and Survey Vessel. That name says it all: these ships are responsible for ferrying crew, scientists, and supplies around the Southern Ocean and Antarctica for science and logistics. They bring the fresh vegetables into station, and collect the samples along the way, carry people to and fro. The eponym of the R/V Gould is Laurence McKinley Gould, an American geologist who known for his exploits at both poles. The Gould is especially important to Palmer Station. Unlike McMurdo or South Pole which are frequently accessed by plane, Palmer is almost exclusively serviced by the R/V Gould. And if you’ve been on station for a month, the Gould is probably a welcome sight – if not for fresh faces of new scientists and support staff, then for the coveted ripe fruits exported from Chile. Trust me, it’s a cause for celebration. I’m fascinated by icebreakers, in part because they are playing piece in an intense political arena. On the other side of the world, in the Arctic Ocean, the comparative strengths of nations’ ice capable fleets are at the center of an international power struggle. Russia, for example, has 40 icebreakers, while the US count sits a staggering…three. Technically, neither the Gould nor the Palmer qualify for this statistic, as they’re actually only “ice-strengthened” and “ice-capable” ships. They can’t crush through as much sea ice as a true icebreaker. And if I had all the time, I’d like to give more research to this topic, I would love to tell you about the variety of hulls and shapes and architectures of icebreakers, but at some point, I have to do my day job, too. But those three icebreakers, they all belong to the US Coast Guard, and go by the moniker of the USCGC Healy, the Polar Star, and the Polar Sea. Only two of these are actually operational, and right now, the Healy is up in the Chukchi Sea, just north of Alaska, on a science mission. The Healy is an Arctic ship by and large, and rarely if ever ventures south – that territory is covered mostly by the NSF vessels. 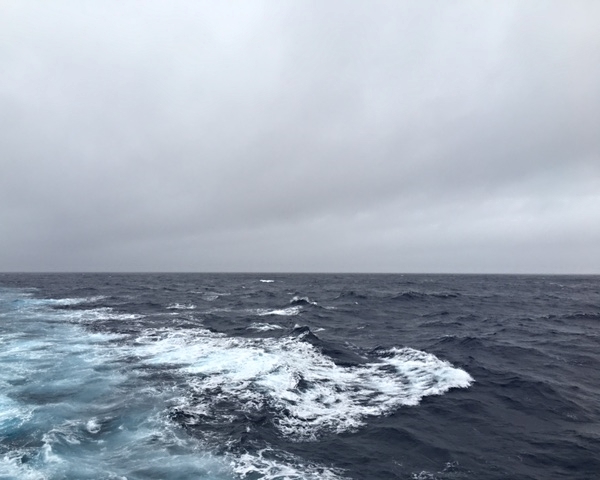 Among the waters that the Gould and Palmer traverse is an infamous straight of ocean sheathing the tip of South America from butting into the Antarctic continent: The Drake Passage. These waters are known as some of the roughest in the world, and they’re a necessary crossing point if you want to access Palmer Station. If you look at a map of the region, it might be easy to see why this little stretch of water connecting the Pacific to the Atlantic is a cataclysm of mal de mar for even the most experienced sailors. This part of the sea is a funnel for the otherwise unimpeded flow of the Antarctic Circumpolar Current, also known as the ACC. The ACC is unique among global ocean currents because it travels the entire circumference of the planet with running into any pesky continents. Long fetches of open water can allow the winds running through the Drake to gather all their might and concentrate it onto a tiny way-fearing ship. But sometimes, you get lucky. Fortunately for us, this was the case. Sure we had some bigger swells that sent dishes flying across the galley table, or woke up for you sleep at night – but all in all? The fury of the ocean was well-contained, and that made for a beautiful crossing. If you haven’t experience the open ocean before, it’s almost an indescribable wonder. In no other context could overwhelmingly uniform view be so incredible and fascinating, in part because its not nearly as uniform as it looks. Every swell, every wave catches the light and dances against the air in a unique way. On gray days, the ocean is frothing adversary, swelling in your heart a feeling of courage. On calm days, the sun shines through thin cascades of water as the waves crest, and the ship churns an unworldly pure baby blue of bubbles into sea. And the ocean is alive from the the tiniest bacteria to the biggest whales, dazzling arrays of geometric phytoplankton in delicate glass houses and graceful dolphins, colored in an hourglass of black and white like you’ve never seen before. And from land, it’s all out of sight, hidden beneath the surface. Being aboard a ship is an enviable reminder of why oceanographers do what we do. Calm waters on the Drake Passage. On our journey across the drake, we certainly took the opportunity to do a lot of things that we oceanographers like to do. In particular, we sought out a way to see how the Antarctic environment changes the diversity of marine life. Remember the ACC - that current that travels around Antarctica, unimpeded by land? Where the ACC hits the warmer waters of the South Atlantic is a known as the Polar Front, and it’s associated with a dramatic drop in temperature. This is also known as the Antarctic Convergence, and it creates a strong demarcation for biological and physical processes alike. When the colder, Antarctic water from the south hits the warmer Atlantic Water, its sinks because its denser, which causes nutrient-rich water to rush up from the deep and take its place in a process known as upwelling. These nutrient rich waters support massive blooms of algae and other photosynthetic organisms known as phytoplankton. To sample the life in this region, we employed a few standard oceanographic instruments and techniques. The primary instrument is known as a CTD, which stand for conductivity, temperature, and depth. Conductivity, which measures how well charges pass through the water, tells us how salty it is, while temperature and depth (derived from pressure) give us a profile of the basic water properties. Typically, a set of bottles is attached to the outside of the CTD, so water can be sampled at different depths as the temperature and salinity are read in real time. To see the biodiversity of the region, we performed several trawls and tows. Trawls and tows entail dragging a net behind the ship at varying depths to capture what’s in the water. These nets can be made of the finest mesh or act more like a broad sieve, capturing anything from fish to phytoplankton. We caught plenty of both, as well as a lot of other wriggling, swimming, darting things. Our most common haul were krill and amphipods – little shrimp the size of your thumb nail or smaller, mostly delicately translucent and painted with faint red speckles. They swim in a way that enhances their delicacy – smoothly contracting their legs in swift pulses to glide from one end of a petri dish enclosure to another. They share their cage with salps, gelatinous tubes that look more like an alien than invertebrate, their red and yellow stomachs – just pinpoint sized filters at the end of a vacuum - betraying their presence. The little guys, all the salps and amphipods, phytoplankton and bacteria – got taken with us as we steamed south, and when we finally arrived at Palmer Station, the team broke off to look at their favorite organisms. For now, though, the lab is a-flurry with activity as we set up our equipment, our instruments, and prepare to investigate the life around our new home at the bottom of the world. The Chilean Andies as we leave Santiago toward Punta Arenas. We arrived to Santiago in a darkness that presaged our upcoming Antarctic winter. Out the windows, only the snow-capped peaks of the Andies were faintly visible. Jimmy's office in Santiago houses the USAP participants heading south. Through this office, Jimmy has guided countless scientists and crew on their way to the southernmost continent. In a different setting, you might think it were a small museum rather than a room at an airport. Memorabilia from all the American Antarctic stations decorate the walls and shelves: pennants with the USAP logo, scale models of the icebreakers Gould and Palmer, even a five foot stuffed penguin holding a Chilean flag. The United States has three stations in the Antarctic. McMurdo Station, on the shores of the Eastern Ross Sea, houses up to 1200 inhabitants in what’s more of a small town than a field station while the Amundsen South Pole Station keeps about 200 at its maximum. On the more moderate, maritime West Antarctic Peninsula, Palmer Station (our destination) holds less than 100. In Santiago, we meet our cohort for the next six weeks, the people we’ll spend hours with on a ship and at the station. Our areas of interest span across multiple trophic levels, from bacteriologists to ichthyologists (who study fish), with plenty of algologists (who study algae) and others filling in the ranks. In the whole, we’re seventeen: fifteen students (graduate students, postdocs, and faculty members), a TA, and our instructor, Dr. Deneb Karentz from the University of San Francisco. A colonialist statue to Magellan and the native peoples of Southern Chile, with a good-luck toe rubbed to a bronze hue. One more flight brought us to a port town at the southern tip of Chile – Punta Arenas. This town is full of Antarctic history. At 53 degrees south, Punta Arenas (or, if you want to sound in the know – “PA”), is the largest city south of the 46th parallel, and a major port for shipping of the Southern Ocean. Statues of Ferdinand Magellan, the famed Portuguese explorer known to be the first Westerner to circumnavigate the globe, speckle the city. Among these, a great obelisk bears imagery of the native population of Tierra del Fuego, a point of interest for superstitious sailors who rub the toe of the figure for safe transit through the Drake Passage. Perhaps less hopefully, the city is also home to a bar which gave Ernest Shackleton a much-needed drink after his fateful trans-Antarctic expedition. But we'll learn more about that later. Fashion in Antarctica modeled for participants. Punta Arenas is also a fortification of the US Antarctic Program, the USAP. Private logistics contractors run the day-to-day details in PA, aboard the ships, and at the stations, but all American activity on the continent is dictated by the National Science Foundation (the NSF). These contractors provide warm clothing for scientists headed south in the form of Extreme Cold Weather gear, or ECW. At a warehouse near the dock, our crew spent two hours yesterday pulling on parkas and squeezing into boots, trying on hat after hat to get the perfect set of gear to bring with us. The R/V Laurence M Gould in port in Punta Arenas. We will make the 5-6 day transit to Palmer Station aboard the R/V Laurence M Gould. The Gould, named for the American polar explorer and scientists Laurence McKinley Gould, is a 230 ft long ship capable of breaking 1 foot of new ice in a continuous steam; it’s an “ice-strengthened” ship rather than a true ice breaker. Supplies, contract workers, and scientists are brought from Punta Arenas to Palmer Station on the Gould, which regularly crosses the Drake Passage to Antarctica. The berthing van, my home for the next 5-6 days. This ship is our home for the next several days. We boarded the boat on Friday, taking our cabins (rooms) and claiming our berths (beds). The Gould supplements its berthing capacity with two specially modified shipping containers in the lower hold, known as the berthing vans ( a term which I have giggling opinions about). I have been assigned to the berthing van, which sits incidentally right near the engines – quiet for now, but underway … well, we’ll see how she sleeps. Today, we’ll being steaming from Punta Arenas to Palmer Station, taking water samples on our way through the Drake Passage. This could be marked as the true start of trip – the beginning of the science mission, the point of true embarking. Over the next several weeks, I plan to introduce you to the crew of the Gould and Palmer Station and the science team as we sally forth towards the edge of the Earth and into the polar night. 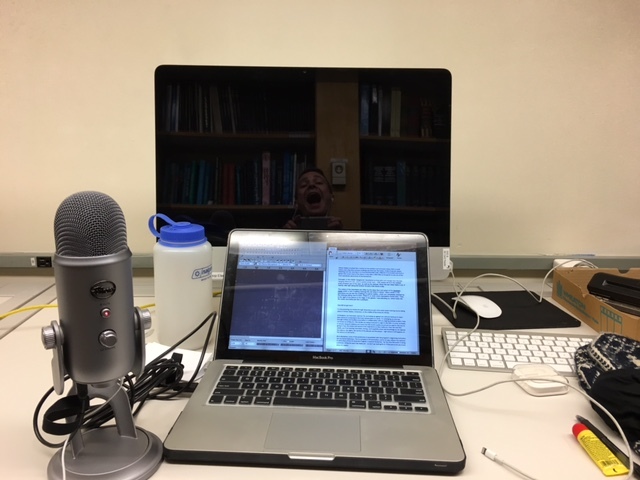 Interviews, pictures, informational posts – I hope to capture the stories, science, and sounds (yes, sounds!) of the trip south as we set sail for the Antarctica. Punta Arenas is the gateway to the Western Antarctic.